Cricket size for 4 month Beardie • Bearded Dragon . org . I have read through a few of the forums and cant really get an answer to what i am looking for. I have my first Beardie called Spyro who is eating us out house and home. We have had him for just over a week and he is 4 months old. Currently he is eating between 50-100 medium gutloaded crickets and 5 medium Dubia roaches a day.... in the UK Dubia roaches are soo expensive so i am not using them as his prime source but he will have at least 5 per day. he also has salad every day and loves rocket, squash, pepper and kale but will not really touch his staple collard greens. After looking online he seems much bigger than other 4 month old beardies so i want to see if medium crickets are the right size for him as some of them are huge and have abit of a hard shell. he seems to eat everything in sight and chews very well before swallowing however I have refrained from feeding these ones too him but shortly i am going to have a box of just large hard shell crickets and nothing to do with them. Any help on this would be great as i don't want to cause impaction by feeding the larger harder shelled crickets? PS Here is a picture of our ferocious beast who is as soft as a teddy bear but unfortunately in shed. Hi there, he's a handsome boy and very photogenic. He's definitely big enough for large crickets. The only reason a dragon needs 100 bugs a day is because the bugs are on the small side for the size of the dragon. Go with the large, 15-20 per meal twice a day at the most [ not " all he can eat " as some say ] along with salad and he will continue to have a good growth rate. BTW, have you thought of raising dubias ? Thanks for the response AHBD, some of the medium crickets are really large (maybe 4 cm) and i am worried about the exoskeleton of them. In terms of the Dubia roaches, i have looked into breading these as the crickets stink and are alot of maintenance. however i have read that it is very common to become allergic to the dubias if you are dealing with them day to day. Also they need to be kept at a much higher temperature to breed than i store them as feeders. I currently buys these 100 at a time which is around £20 cheapest. The first day we had him we were told he probably wouldn't eat whilst he settled in but he was with us on the sofa and eating crazy amounts straight away which is always a good sign he has settled in perfectly. How big ( grams ) is he. I was giving 1/3 size crickets to my beardies at that age. So he has just had his first health check at the vets and he is in great health. However when I said he looked huge for his age (4 months yesturday) he really is. He weighs in at 170g. Some of the crickets ( the ones I am talking about) are much darker in appearance and have want looks to be a harder she'll than these crickets. Spyro2018 wrote: So he has just had his first health check at the vets and he is in great health. However when I said he looked huge for his age (4 months yesturday) he really is. Maybe the shop were wrong about his age when you bought him. All bought as pairs from two different local hobbyist breeders who knew the age of mine within a day. for my gang and they were on two meals of insects per day + salad. Spyro was also bought from a breeder ( i have only ever seen normal dragons not morph dragons in pet shops in the UK) and i was told they use the date of the last hatching from the clutch. Here is a picture of some of the crickets i am nervous about feeding as they seem abit hard. Rule of thumb : if the cricket is longer than the distance between beardie's eyes , it's too big. Spyro could eat those, but not many at one time. 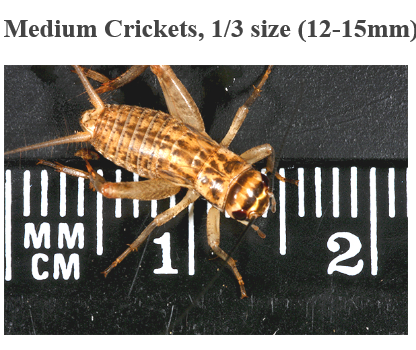 The problem is with your cricket supplier, the smaller ones there are too small, they are not medium crickets. Then the large ones are mixed right in. Can you speak to the cricket supplier and ask why there are no in between sizes ? AHBD wrote: Spyro could eat those, but not many at one time. 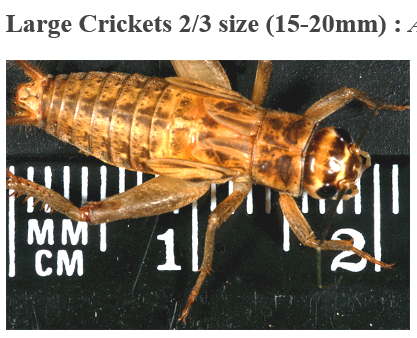 The problem is with your cricket supplier, the smaller ones there are too small, they are not medium crickets. Then the large ones are mixed right in. Can you speak to the cricket supplier and ask why there are no in between sizes ? In the meantime, feed out the larger crickets and keep the smaller ones in a keeper , feed them and they will soon grow , in a couple weeks they will be big. Hi All, thanks for your feedback. Spyro is growing so fast it is insane, we have had confirmation from the breeder the age is correct and he is now 17 weeks old and is nearly 17" & 240g. Would it be possible to have German Giant in his breed line with out the breeder knowing or is he just in an insane growth spurt? He is also in full Torso, head and front leg shed at the moment after shedding out his tail and back legs. Well, he is certainly a fast growing big boy. No way to say that he has G.Giant in him but that is definitely a possibility of being part of his genetics because many of those were bred in the U.S + a few other countries for years. Just like you can be 25 % Irish or 10 % Irish, but with a beardie you really can't say but it can't be ruled out either. Anyway, he looks good + healthy and can definitely eat large crickets at his size.